After 33 years in the chocolate business, the last few as a consultant, Master Confectioner Tom Cinnamon has developed many fine confections and a wealth of knowledge about chocolate & candy making. 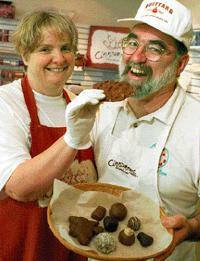 Since April of 2000, Tom & his wife Kathi have begun putting those talents to use in their own shop, Cinnamon’s Chocolates at 106 East 2nd Street in North Vancouver. Tom & Kathi and their staff make delicious home style, handmade chocolates and other confections from the finest ingredients available daily. Cinnamon’s also uses Organic Cream from Avalon Dairy, which deepens the rich flavour of our caramels and buttercreams. The Orange Buttercream contains whole ground organic oranges in addition to a marriage of several natural orange flavours to achieve the best taste. Ingredients are obtained from where ever the best quality & most flavourful product is available. Pistachios from Turkey, Ginger & Orange Peel from Australia, First Grade Jumbo RedskinPeanuts from Virginia, Cashews from India are among the ingredients that come from many different parts of the world. Tom, who in addition to his years of experience has been trained through courses in Belgium, Pennsylvania and California and is still teaching all over North America, and is enjoying the return to work with a small, hands on operation where there is satisfaction each day in fine chocolates produced. A unique feature of Cinnamon’s Chocolates is the viewing window where visitors can see what is happening in the kitchen. The Cinnamons’ envisioned a kind of “micro brewery” of chocolates and are pleased with the resulting interaction between the kitchen and visitors.